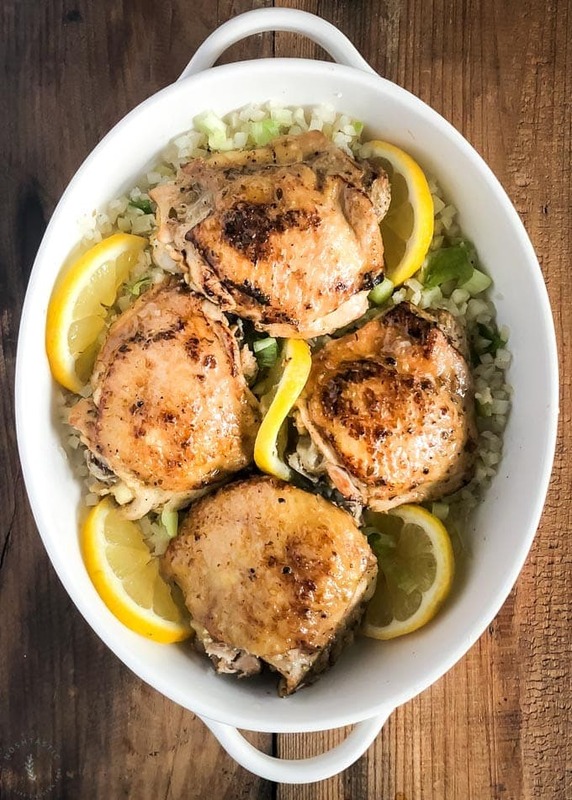 My Instant Pot Greek Chicken recipe is one of our favorite Keto and low carb dinners to make in my pressure cooker! 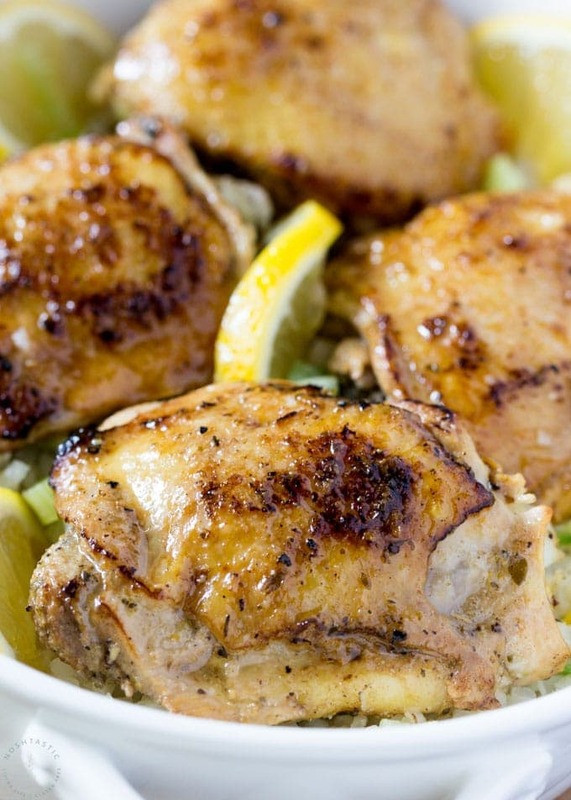 With approximately 5g net carbs per serving, this is a winning low carb chicken dinner! It does require a marinating for at least four hours or more in order to maximize the flavor, but it’s really a very easy recipe to throw together and I know you’re going to love it! As mentioned above, this recipe for Greek Chicken will taste best if you use the full marinate time. Pressure Cooking can tend to flatten flavors so you’ll want to marinade it for the full time to ensure success. I also like to turn over the ziplock bag with the chicken in it on the fridge shelf halfway through the cooking time so that the marinade will drain to the other side and more evenly marinate the chicken. If you use the saute setting on the Instant Pot to brown your chicken just be aware that you’ll need to ensure that the pot is fully deglazed before you pressure cook, or you’ll risk getting the burn notice come on if anything is left stuck to the bottom. You may find it simpler to brown the chicken in a cast iron skillet, that’s my preferred method as I find that the chicken skin often sticks to the base of the Instant pot and the temperature is harder to control. You can make this with chicken breast, but I recommend bone in chicken thighs as the taste is much better for this recipe. What is in Greek Seasoning? Greek seasoning mix usually comprises a combination of flavors including, oregano, garlic, salt and pepper. Sometimes it will also contain warming spices such as cinnamon, nutmeg, or some combination thereof. What Can I serve with Instant Pot Greek Chicken? As we are currently following a low carb diet I served it with a simple side of sauteed Cauliflower Rice. If you are not worried about Carbs you could serve it with rice which you can cook at the same time as the chicken, using the ‘pot in pot’ method. If you want more details on how to do that – it’s really easy if you have a bowl or container for the rice and a tall enough trivet – just take a look at my recipe for Instant Pot Adobo Chicken, it details in the post how I made ‘pot in pot’ rice along with the chicken. 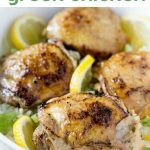 Can I marinate my Instant Pot Greek Chicken a day ahead? 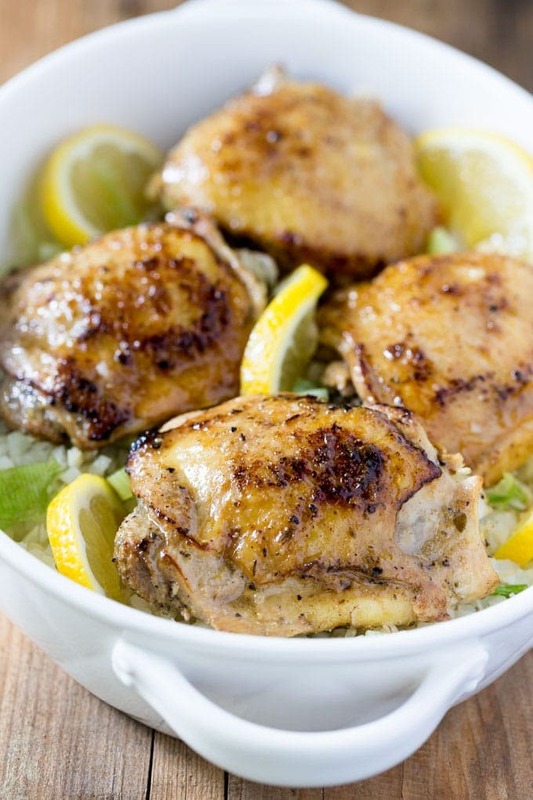 Yes, you absolutely can marinate your Instant Pot Greek Chicken a day ahead! The longer marinating time will allow the flavors to permeate the chicken and the lemon juice will help keep the meat tender, so it’s a win win. 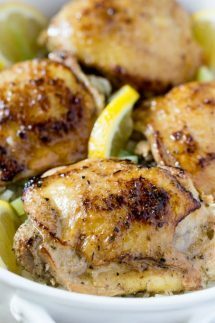 Instant Pot Greek Chicken recipe that's Keto, Low carb, Paleo, Whole30 and Gluten Free, it's really delish and so easy to make! Salt both sides of the chicken and let it sit for 20 at room temperature, don't skip this, it will really enhance the flavor. Add the chicken thighs to a ziplock bag along with the remaining marinade ingredients, rub it well in to the chicken, remove the excess air from the bag before you close it, and let marinate for at least 4 hours or up to overnight. I like to turn the ziplock bag over on the shelf in the fridge halfway through the marinate time. This allows the marinade to drain to the other side and more evenly marinate all the chicken pieces. Remove the chicken and keep the ziplock bag with the remaining marinade. Add 1/4 cup water to the remaining marinade and to clean out the bag a little, this will be your liquid to pressure cook the chicken. In a large cast iron skillet, add 1 tbsp olive oil and turn onto a medium heat. When hot add the chicken thighs skin side down and cook for about 8-10 minutes until skin is browned, then turn and brown the other side for about 2 minutes. If you prefer you can use the saute function in your pressure cooker to brown the chicken, but sometimes I find it sticks and it's simpler to brown skin on thighs in my cast iron skillet. Deglaze the pan you cooked the chicken in with the remaining marinade then add the deglazed liquid to your pressure cooker and place the chicken in the liquid on the base of the pressure cooker, skin side up. Lock the lid and turn the pressure valve to 'sealed', then pressure cook for 8 minutes. When the cook time is up allow the pressure to drop fully before opening the lid. This will take approximately 10-15 minutes. This looks great but it won’t print!! Hi Karen, the print button should be fixed now, let me know if you have any further issues with it. How long would you cook bone in chicken breasts?Hubby not crazy about thighs..